No words are needed when the joy is present on the faces of so many. Thanks to the Jerome Optimists and Project Coordinator Sheri Mitchell for a job well done! Click here to read all about it in the Magic Valley Times. I love Google. 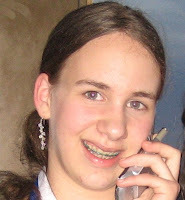 I use it as a search engine, for research, and as a host for our PNW District Optimist Blog. One of the most delightful things about Google is the smile I get when I open my browser and see they have done something creative with the Google logo. 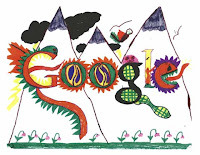 Over the past year, Google instituted a K-12 Program called Doodle 4 Google. They provided teacher resources, judging criteria, and prizes and invited students across the United States to participate by creating an original drawing using the theme "What if?" Shown here is a drawing from Barbara Paredes, Hall Elementary School, Gresham, Oregon. Her picture is titled " What if dragons were real?" Best of all you can now see drawings from all the regional winners right here. I promise, I'll watch and get the word out when it's time to participate in 2008. Be sure to share this exciting project with the schools, teachers, and students that your Optimist Club serves. I hope you enjoy their creativity as do I. The Issaquah Optimist Club has expanded their reach with the Optimist Bike Safety Fair by partnering with presenting sponsors Overlake Medical Center Issaquah and Washington Imaging Services. Two events will be held this year: June 6 at Issaquah Valley Elementary School in Issaquah, Washington and June 7 at Lake Hills Elementary in Bellevue, Washington. The Auburn Optimist Club’s 18th Bicycle Safety Fair will be held June 7 at the Auburn Eagles parking lot, 702 M Street NE. They are partnering with the Auburn Eagles, Auburn Firefighters and Police Officers and co-sponsors Verity Credit Union, State Farm Insurance and Fred Meyer. Bike Safety Fairs are one way that members of Optimist Clubs personally participate in helping keep our youths safe. Approximately 115,000 individuals belong to Optimist Clubs in the United States, Canada, the Caribbean and other countries around the world. Download the registration forms for the PNW District qualifying tournaments for the Optimist International Junior World of Golf Championships (OIJGC) here. Find out all about the tournaments by visiting the PNW District page at Optimist International. Don't wait until next March to share the spirit of Optimism. All you have to do is "just ask." The PNW District of Optimist International hosted the District Oratorical Contest in Newport Beach, Oregon on April 26. Eight wonderfully poised contestants from ages 10 to 15 each spoke on the topic "Why Me? Why Not?" Following their performances, district oratorical chair John Bareis dismissed the judges to deliberate with the caution, "I'm glad it's not me that has to make the decision." But the judges did decide and emerging victorious was Clareesa Jones from Vancouver, WA. You can watch a recording of her speech at the club level here. Ms. Jones receives a $1,500.00 college scholarship from the Optimist International Foundation for her victory. Earning second place and a $1,000 scholarship was Arianne Melton from Gresham, Oregon. Austin Lundin from Hillsboro, Oregon placed third and will receive a $500.00 scholarship. Other finalists were Bengt Freepons, Pasco-TriCities; Emma Walter, Pasco-Tri-Cities; Mackenzie Hoff-Bell, Mission , BC; and Rabeel Jaweed, Vancouver-North Shore.